Brad Birkenmeier, 24, of Winfield, said that running on the field at Busch Stadium is "something I've always, always, always wanted to do." He said he only had two beers before hopping the fence to run the field. When he was tackled, the ushers "dropped me pretty hard," and he was taken to a jail cell inside Busch Stadium, then to the St. Louis city jail. There, other people arrested that night - and even the jail guards - recognized him as the guy who did the somersault. A St. Louis Municipal Police Department spokeswoman said he was charged with being a spectator on a playing field without permission. According to the city code, the penalty for spectator going onto the field is a fine between $25-$500 and/or imprisonment for not more than 30 days. The other man who ran on the field was a 32-year-old from Marion, Ill., who was charged with the same thing. "I'm not going to lie, I don't regret it," Birkenmeier said. Birkenmeier has tickets to Wednesday's baseball game, with the same group of friends he went with last night. "We'll keep it a little more calm this time." View video of a KTVI interview with Birkenmeier. Busch Stadium fans see their share of runners on the field. But not somersaults. A better view of the somersault. Shoutout to everyone in STL learning how to spell somersault correctly today. We had the rally squirrel. But this game tonight we had the rally streakers! The 2011 World Series ring features the Rally Squirrel. 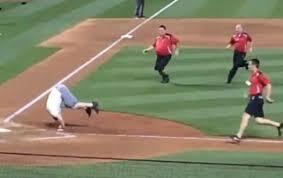 If the Cardinals win it this year, I hope the 2015 ring features the #RallyStreaker. Let's go to the judges for their score. @timlybarger Why do you assume he's a Cardinals fan? Just sayin! But I give him a 9.5 on the somersault! My gymnast daughter was curious about the guy on the field at #BuschStadium - "What kind of somersault?" she asked. I said "A six at best." Cards game had it all, grand slam, comeback win, sad Cubs fans, somersault guy & @Foximoxie & I were on KISS Cam!! lol how cool is that? The somersault onto home plate to end it was icing on the cake. @Cardinals @jcluts41 @PeteArgo1 Bet the idiot who did the somersault at home plate isn't feeling too good today! Probably not. Fans who run on the field have previously been charged with being a spectator running on the playing field, which carries a fine and possible jail time. A fan who strips, then runs on the field could face additional charges of lewd and lascivious behavior.